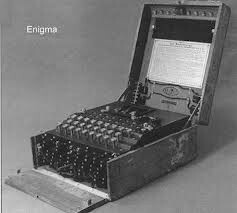 The Enigma Machine was the Nazi way, in World War II, to communicate without the other countries being able to know their plans. The machine was created by Arthur Scherbius a German engineer. The machine consisted of a keyboard, a plugboard, rotors and a lampboard. The keyboard was where the code is written, it is typed in English/Deutsch. The plugboard is where the letters are changed from the original letter to a completley diferent letter. This letter is then sent through the rotors, a set of 3 out of 5 that could be chosen, which then changes the letters again. The lampboard is where it shows the letter that has been changed. If you wanted a Q, in a few seconds the lampboard would light up with the new letter. Some Polish mathematicians first broke Germany's military Enigma code in December 1932. Five weeks before the outbreak of World War II, on 25 July 1939, they presented their work to on how to decrypt the code to the French and British Military in Warsaw. How did it help us win the war? It helped us win the war because we were able to decode the Nazi codes. This gave us co-ordinates on where the Nazi's next attack would be, which would have saved lots of lives, and their plans for the future. The Polish mathematician's that sent us the their work on how to decrypt the code helped us a huge deal and represented a vital basis for the later British effort.